Summary tree based on nuclear and mitochondrial DNA sequence data (Birks and Edwards, 2002). This tree is consistent with a morphological character-based reconstruction (Jones et al., 1995) except for the placement of the root (within the mound builders for the latter). A. bruijnii, four species of Megapodius (M. bernsteinii, M. laperouse, M. nicobariensis, and M. geelvinkianus) and two species of Talegalla (T. cuvieri and T. jobiensis) were not included in these analyses. Birks, S. M., and S. V. Edwards. 2002. 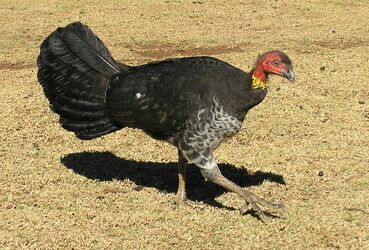 A phylogeny of the megapodes (Aves: Megapodiidae) based on nuclear and mitochondrial DNA sequences. Molecular Phylogenetics and Evolution 23: 408-421. Clark, G. A. 1964. Life histories and the evolution of megapodes. Living Bird 3: 149-167. Frith, H. J. 1956. Breeding habits of the family Megapodiidae. Ibis 98: 620-640. Jones, D., and S. Birks. 1992. 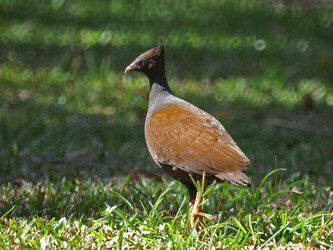 Megapodes: recent ideas on origins, adaptations and reproduction. Trends in Ecology and Evolution 7: 88-91. Jones, D. N., R. W. R. J. Dekker, and C. S. Roselaar. 1995. The Megapodes. Oxford University Press, Oxford. Page: Tree of Life Megapodiidae. Megapodes. Authored by Joseph W. Brown. The TEXT of this page is licensed under the Creative Commons Attribution-NonCommercial License - Version 3.0. Note that images and other media featured on this page are each governed by their own license, and they may or may not be available for reuse. Click on an image or a media link to access the media data window, which provides the relevant licensing information. For the general terms and conditions of ToL material reuse and redistribution, please see the Tree of Life Copyright Policies.